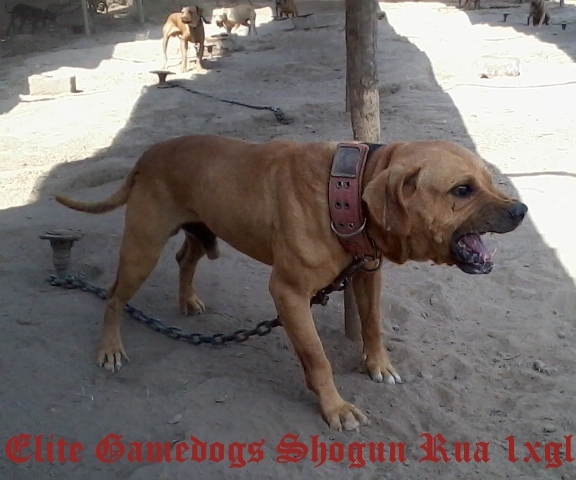 Shogun Rua was hooked an showed being a Young dog, he lose against "Pachacamac & Coraje sur kennels El Choche 1xw (handled and trained by Imperios kennel)" in 57min making the courtesy scratch. I personally take the responsibility of his loss cause give him a poor and short keep and this is not an excuse, Choche won fair and square!!!. People who knew Shogun Rua before the match saw he was a real game dog cause was tested good, People who see him after his match (cause I roll him twice) know that Shogun rua 1xgl was not the same dog who match that 20th December. Was my Failure and always will be, Forgive me my loyal friend you always will be the great warrior you always showed to me.